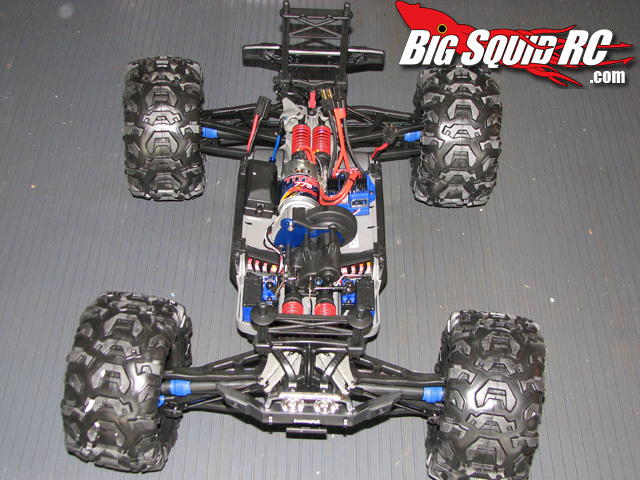 Traxxas Summit Review « Big Squid RC – RC Car and Truck News, Reviews, Videos, and More! I have seen the top of the mountain, and it is good! 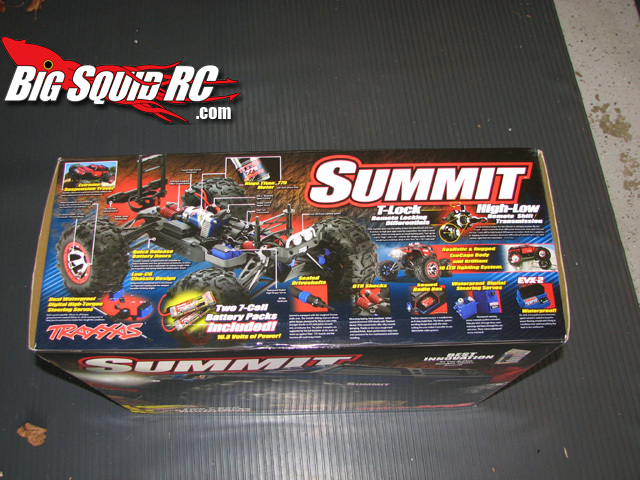 When first unboxing the Traxxas Summit, one word comes to mind, BIG. 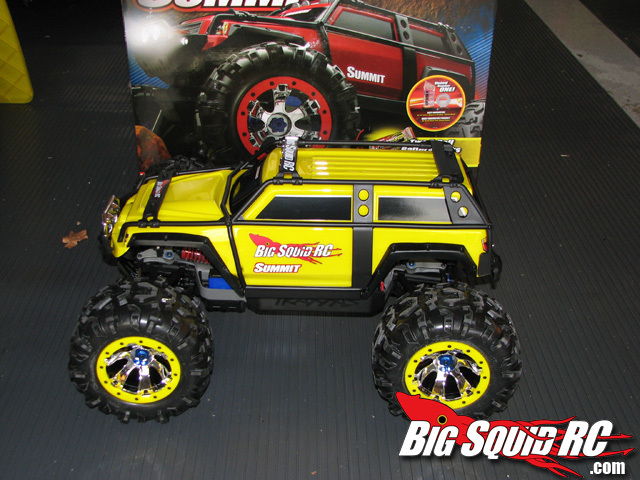 Big wheels, big tires and a big suv body. 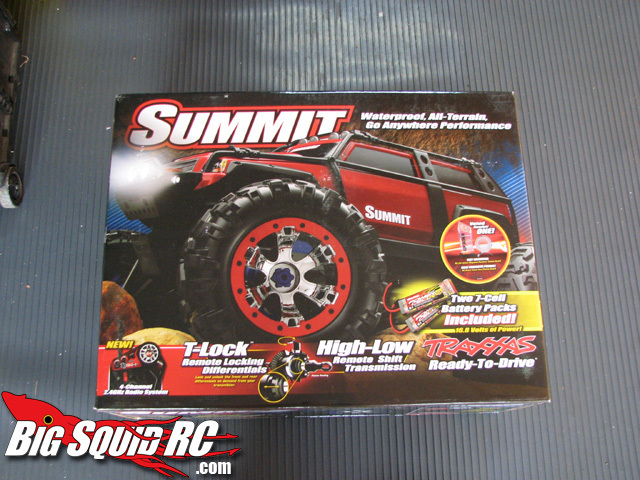 Just looking at the Summit, it looks like it can go anywhere and do anything, and that is exactly what Traxxas built it for. The Canyon A tires look like they would grab on any kind of surface. 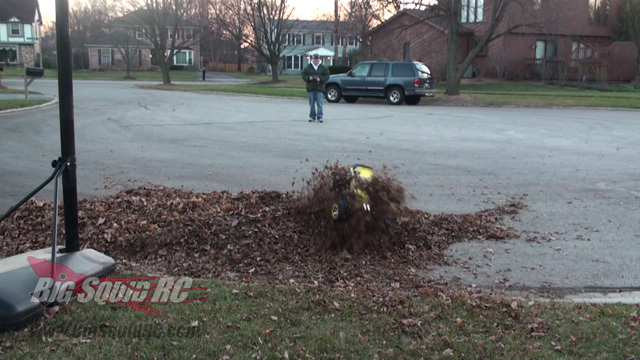 Combine that with the T-Lock remote locking differentials and the transmitter-operated High-Low transmission, and you have one serious basher! Looking at the outside of the truck, you have 10 l.e.d. 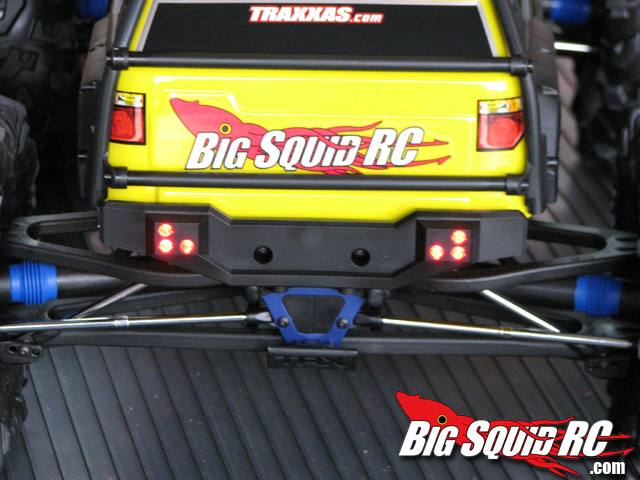 lights on the bumpers (4 in the front and 6 in the rear) that give an even more realistic look. The ExoCage body held up well to our brand of testing. 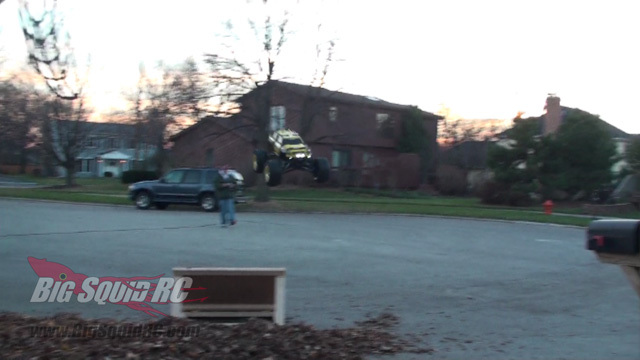 This included running upside down across a parking lot at full throttle. Under the body is just as amazing. A massive Titan 775 Motor moves the high-low transmission. And the waterproof EVX-2 esc and 5 servos means the bashing don’t stop because it’s raining or snowing. Yes I said 5 servos! There is a lot going on under the hood of this thing, how well does it all work? 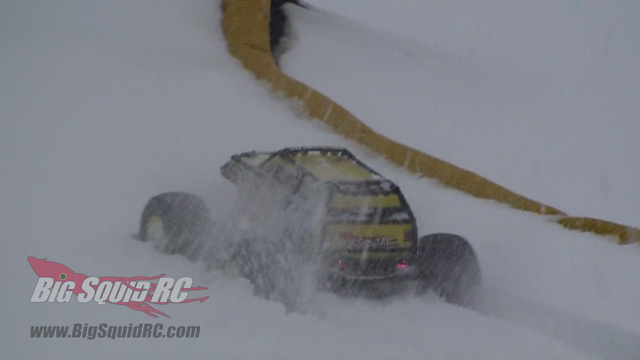 When we took this monster out there was no stopping the fun we had. The high gear (25:1) had it doing 22mph on the supplied twin 7 cell packs. 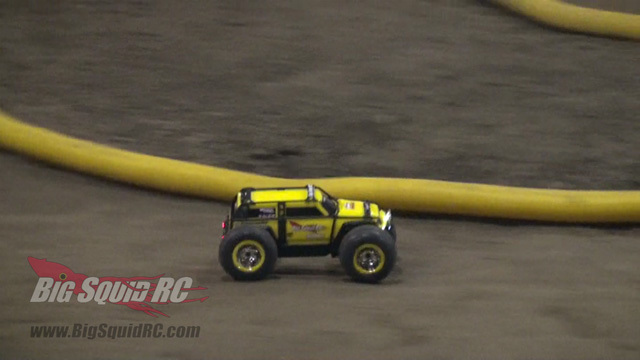 Not that fast to us, but when you flip the switch on the 4 channel TQ 2.4GHz radio and go to low gear (70:1) you can easily pull a small child across the floor. Unlike many of the vehicles we have been testing lately, this beast was going to have no problems running in grass, leaves, or anything else we could throw in front of it. 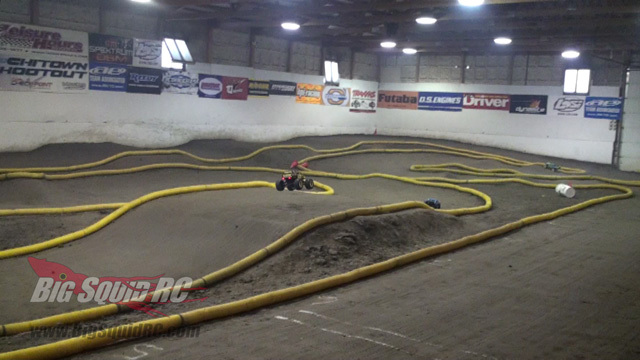 The world has been so caught up in the short course scene, it’s nice to get back to the bashing roots! The Summit made quick work of the leaf piles we had laying around, and it was fun to experiment with locking and unlocking the differentials to see what we could to do get unstuck when those times arose. The low and high speed shifting was a interesting feature, and we did a little crawling on the curbs and rocks. Out on a trail somewhere is like an idea situation for the truck. Speed when you need it, and power when you need it more. How often you actually end up in that sort of situation all depends on you and where you live. On the track we could see the effects of locking and unlocking the diffs as we traveled through the air off the jumps. It was the difference between having some control in the air, or just goes nose down. 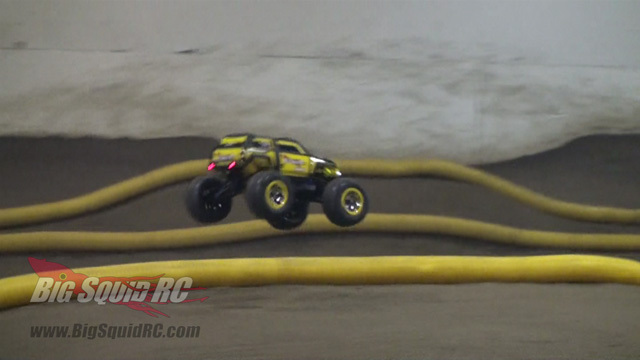 This truck was not really built for the track, but it was fun to scare the people driving their little ‘speed bumps’ around as we would come barreling down the whoop sections. 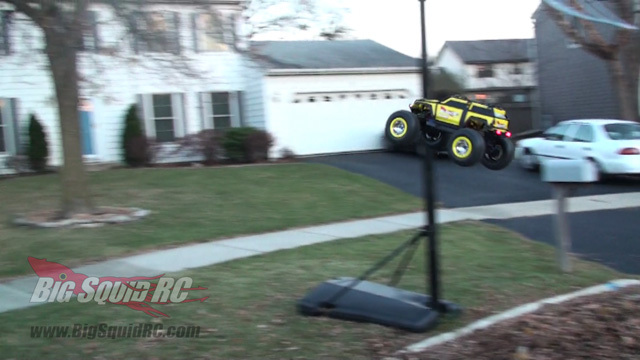 The suspension worked well and really gives the truck a soft ride. Back outside it was in its element. 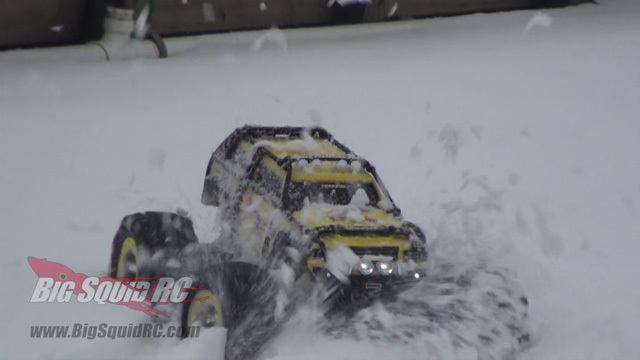 The snow was coming down and there was fun to be had! 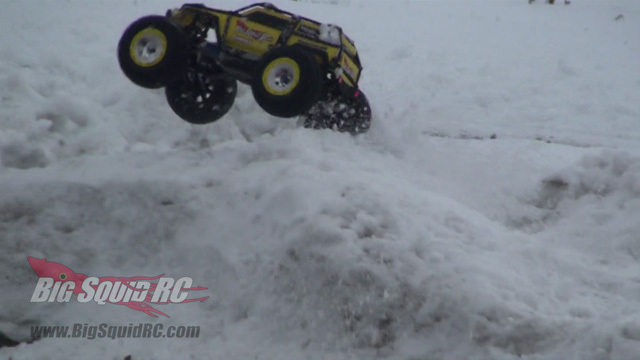 Throwing roosters of snow off the massive 7″ tires and blasting across the snow banks was a lot of fun. All that bashing did make us want a little more speed, you can never have enough speed right? We’ll save that subject for another write up. 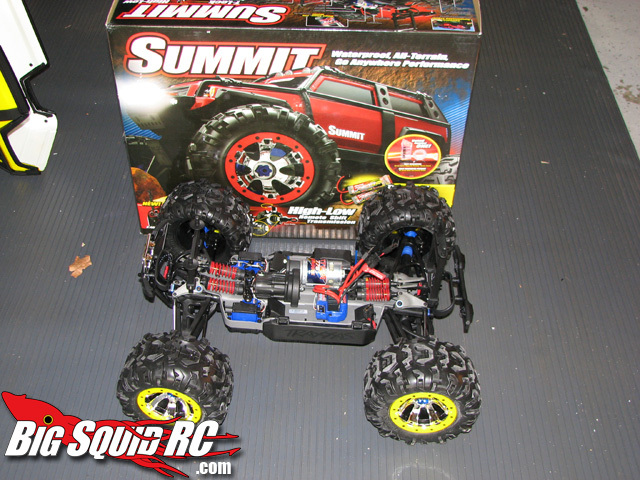 If you’re looking for a go anywhere basher, look no further then the Traxxas Summit. 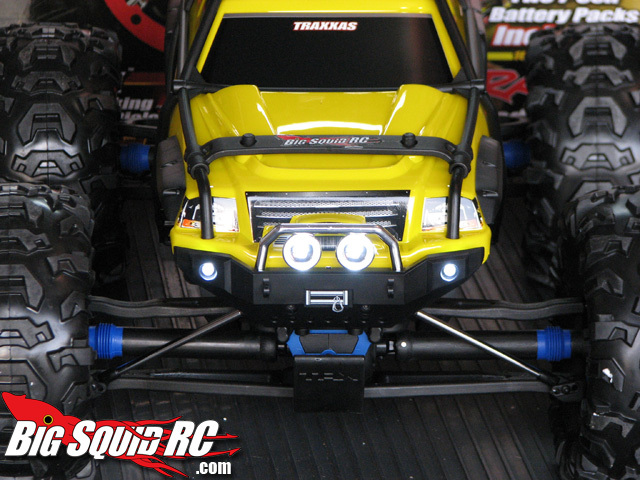 It’s built for the trails, for the streams, for the mud, dirt and snow! Overall I’d have to say this truck feels like it was overlooked. Maybe the top speed was a turn off for some folks, or they were unsure if it’s supposed to be a monsters truck, or a crawler. Maybe it was the price. Five servo’s alone can add up quickly. Taking a step back, it does a little bit of everything, and it does it well. If you have some trails you like to bash at, or a camp site or something, this is the vehicle you are going to want to have with you. 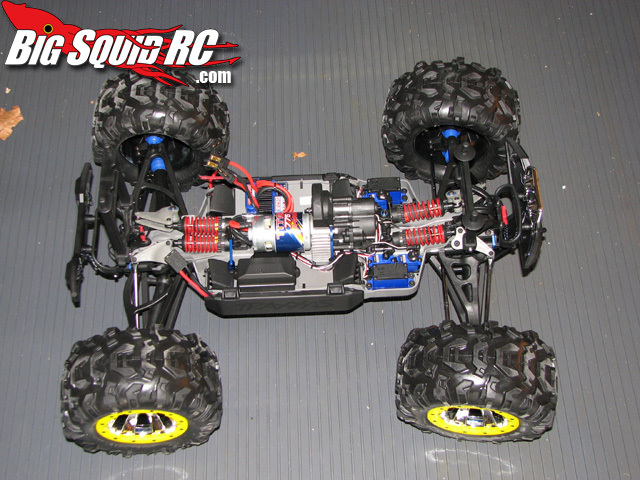 Time To Bash – 8.5/10 – Charge the supplied batteries and go bash! 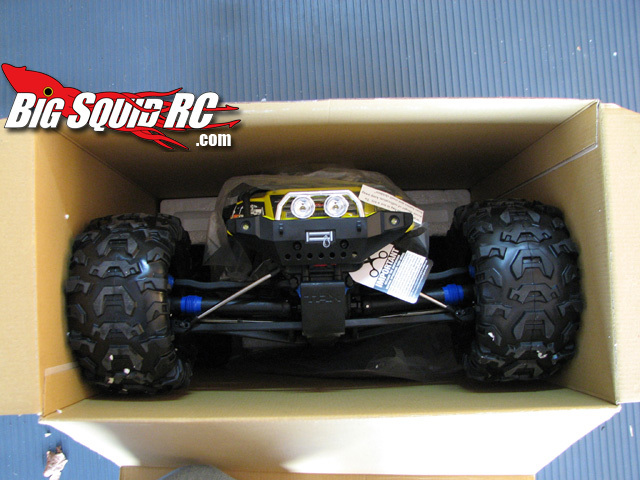 Workability – 9.0/10 – Slightly based on the Revo means this truck will be easy to work on. 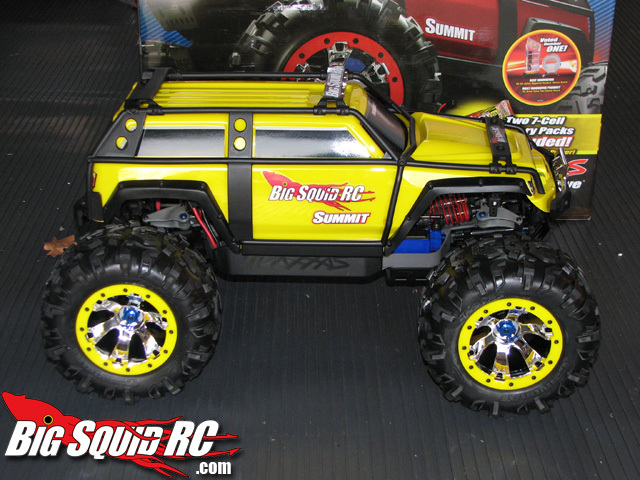 Car Show Rating – 9.5/10 -10 LED lights, cool ExoCage body, massive wheels and tires! This thing looks great! 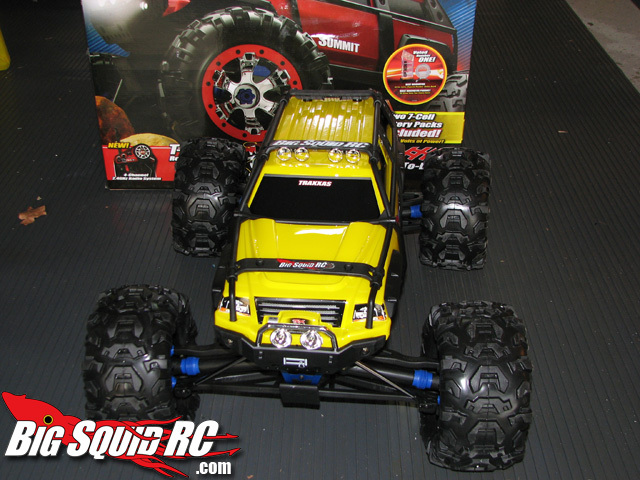 Bash-A-Bility – 8/10 – A tough go anywhere truck, just wish it had a little more speed. 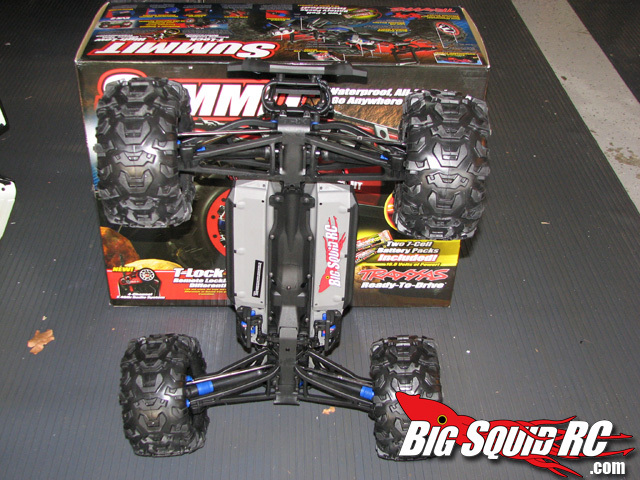 Big Squid Rating – 9.0/10 – Tentacles.. The price is a bit high, but you get what you pay for. 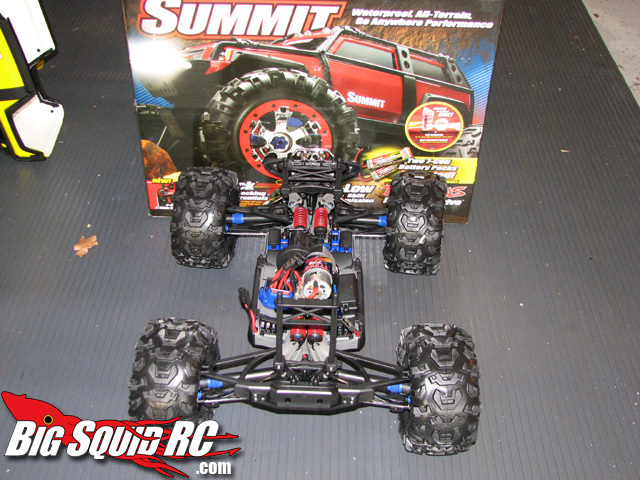 Traxxas quality and reliability! It’s a truck that you will have a hard time putting away at the end of the day, and your day won’t end because it’s broke.